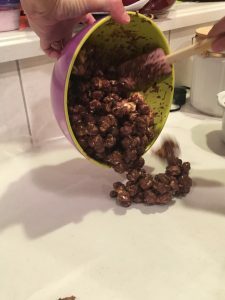 Another addictive, and quick, holiday treat is Moose Munch. 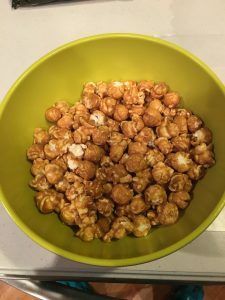 While you could make the caramel popcorn yourself, the treat would then no longer a quick one to make, so let’s begin with purchased caramel corn. I often stock up during the Cub Scouts annual popcorn sale. For this treat, I use a chocolate candy coating found in grocery stores, typically in the seasonal baking section. I melt the chocolate using my microwave’s “melt chocolate” feature – but melting instructions should be listed on the package of chocolate. While the chocolate is melting, put the popcorn into a large mixing bowl and cover a section of your counter with waxed paper. When the chocolate reaches a smooth melted consistency, simply begin slowly pouring chocolate over the popcorn. 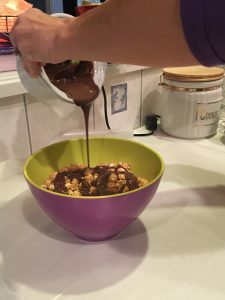 Using large salad type spoons, lightly mix the popcorn and chocolate mixture. It’s best to add the chocolate a small amount at a time as opposed to pouring in all of the chocolate at once. Your goal is to have each piece of popcorn somewhat covered in chocolate, but not to have every piece completely chocolate covered. 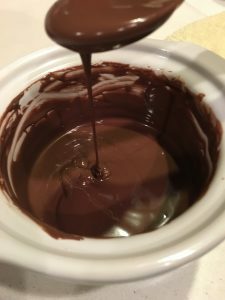 After mixing in the chocolate, and while the mixture is still warm, pour the mixture onto the wax paper to cool and harden.